At 22:08:00 GMT on Monday evening, Loïc Féquet’s crew crossed the finishing line of this first leg of the Vendée St-Petersburg. 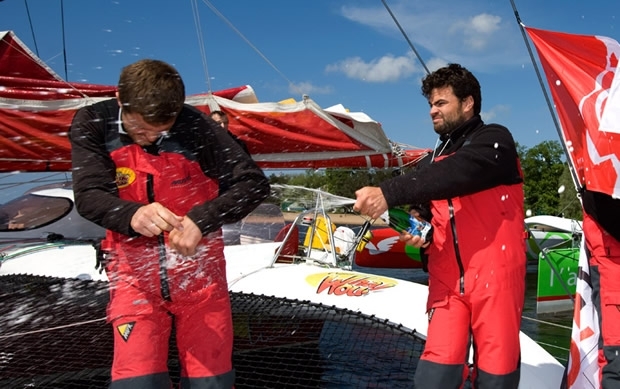 Taking third place, Loïc, accompanied by Victorien Erussard and Mathieu Souben, confirmed that these three young racers were truly worthy of being entrusted with the helm of Franck-Yves Escoffier’s former boat. They started off quite gently, taking their time to get to know their machine to build up gradually as the race developed. Finding themselves stuck off Cape Gris-Nez in the Dover Straits, they were forced to let the two frontrunners make their getaway, but remained just as united in their efforts and continued to push their trimaran as hard as they could, to ensure they would not have any regrets later. They now have the return leg ahead of them to show that they have got what it takes to keep up with the two leaders. It was just after two in the morning in Russia, when they crossed the finishing line, which meant a few hours of waiting before they could clear customs in St. Petersburg. They were given a triumphant welcome by the French and Russians, who turned up to welcome the trio, who were clearly delighted to have reached Russian soil. "Hi, we’re a bit late in sending our news today. There are days like that, where time slips by and you can’t do anything about it; a manoeuvre, a meal, a watch, the rankings which interest us, a bit of DIY and the day has gone again. Time at sea is not like time on land and we don’t have the same obligations. They tend to be a bit more flexible. It seems to us that for people back on dry land, it can all get very repetitive, as for a sailor, the only things that really worries us is the wind, which propels our boat or not, as the case may be. That’s what we have indeed been missing since the start and in the long run, it gets very annoying.... So it’s starting to drag a bit, and all we can do is put up with it without being able to choose between this route or that. If in fact we’re moving, it’s already something to celebrate. That’s why the routine of writing to you is difficult for us to grasp. But it’s only this once and it won’t happen again. We’ll make up for it tomorrow!!! Have a nice evening." A lot of boats are due to finish tomorrow: It is going to be close. So the suspense is with us until the finish! Four multihulls are due in tomorrow afternoon: Anne Caseneuve (Naviguez Anne Caseneuve), Lalou Rouquerol (Région Aquitaine Port-Médoc), Erwan Leroux (Fenêtre A.Cardinal )and Pierre Hingant (La Mer révèle nos sens ).